The history of China is a history of warfare. Rarely in its 3,000-year existence has the country not been beset by war, rebellion, or raids. Warfare was a primary source of innovation, social evolution, and material progress in the Legendary Era, Hsia dynasty, and Shang dynasty- indeed, war was the force that formed the first cohesive Chinese empire, setting China on a trajectory of state building and aggressive activity that continues to this day. In Ancient Chinese Warfare , a preeminent expert on Chinese military history uses recently recovered documents and archaeological findings to construct a comprehensive guide to the developing technologies, strategies, and logistics of ancient Chinese militarism. The result is a definitive look at the tools and methods that won wars and shaped culture in ancient China. P. H. Liotta, author of The Real Population Bomb: Megacities and Global Security "After decades of intense and dedicated scholarship, Ralph Sawyer has produced an astonishing volume. His linguistic and strategic skills--his fierce genius--are everywhere in evidence. Sawyer is a master, and Ancient Chinese Warfare is his masterpiece." Ralph Peters, retired Military Intelligence officer and author of The War After Armageddon "Ancient Chinese Warfare is, paradoxically, a crucial book for the 21st century. As the 'new' China aspires to global power, understanding the foundations of this civilization's way of war helps us grasp Beijing's present psychology and behavior. The Chinese take a very long view of history, and we need to learn to do so. To that end, the brilliant work of Ralph D. Sawyer has long proven unrivalled...and this book is his masterpiece. No work better illustrates the deep (and gnarled) roots of China's contemporary ambitions." Nicola Di Cosmo, Henry Luce Foundation Professor of East Asian History at the Institute for Advanced Study "Ancient Chinese Warfare is an important, informative, and exciting book. Written with panache, brimming with new ideas, and based on a level of knowledge that would challenge any expert, Sawyer's work has transformed single-handedly our understanding of ancient Chinese military history. 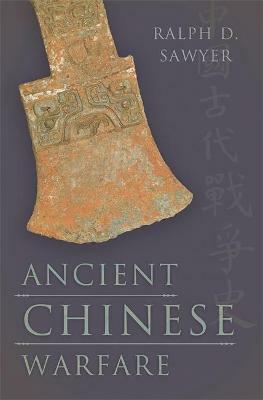 Readers will find in this book a solidly informed and vivid account of China's ways of warfare from the Shang dynasty to the mid-first millennium BC. Only few of them will appreciate the massive effort of synthesis and analysis that this book represents, and it is to Sawyer's credit that he has succeeded in bringing an extremely difficult topic to a level that everyone can understand, learn from, and enjoy." Edward N. Luttwak, author of The Grand Strategy of the Byzantine Empire "Not unexpectedly, this book enhances Ralph D. Sawyer's reputation as the premier interpreter of Chinese strategy and warfare. The surprise is that with the aid of a flowing style he has written a highly readable, indeed very enjoyable book on a seemingly abstruse subject. In a manner fascinating in itself, Sawyer brilliantly reconstructs the fragmentary archaeological evidence." Ralph D. Sawyer has worked extensively with major intelligence and defence agencies, as well as lecturing and consulting internationally on China. A Fellow of the Centre for Military and Strategic Studies, he is the translator of numerous books from the Chinese military corpus, including The Art of War. He lives in Cape Cod, Massachusetts.